Stubby came to CPR ion March 2012. He was owner surrendered when his family’s home was being foreclosed on. Stubby made his personality known immediately at the Vet’s office by biting a vet tech! Afterward, there was a hands-off policy initiated by the Vet’s office and a call went out to a CPR volunteer that had some experience working with dog training and behavior issues. 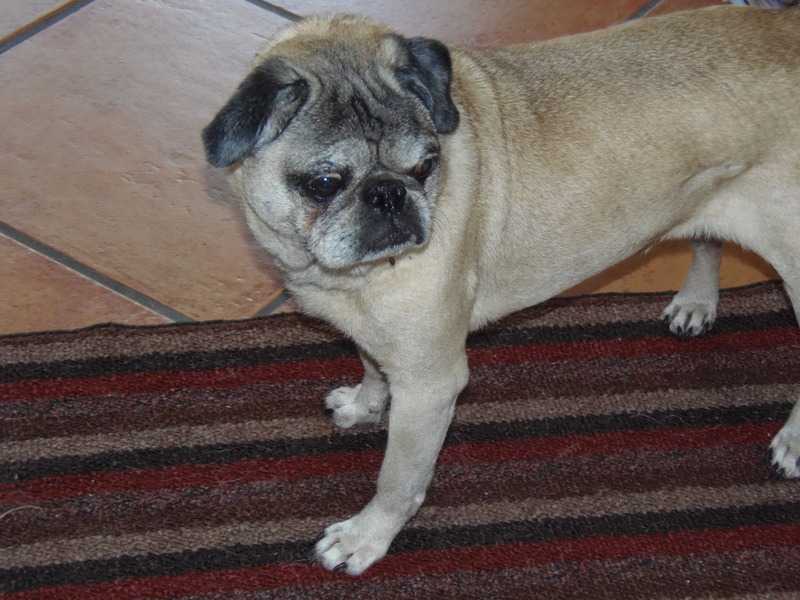 She was shocked by this handsome little pug’s behavior and said it was the worst that she had seen – especially in a pug! But, she said she’d take him on for an evaluation and some behavior training. After a short time, the volunteer knew that Stubby would not be a candidate for adoption through the rescue. His behavior was so extreme and unpredictable that they thought the only choice might’ve been to let him go. The CPR group was heartbroken at the idea of having to put to sleep a 7 year old – otherwise healthy – pug. CPR and the Volunteer agreed that it could be possible for Stubby to live a happy life with people that understood his personality, could live with it and loved him for it anyway! Stubby was neutered, brought up to date on vaccination, had a dental done, had a cyst removed from his side and was put on heartworm and flea/tick preventatives. Today, Stubby continues to live in permanent foster care with that volunteer and is thriving! Recently, Stubby (now over 13 years old! ), had an abscessed tooth and was rushed in for an emergency dental/extraction. He recovered nicely and is back to his old self! Thanks to the generosity of CPR’s supporters, Stubby has gotten to live out the rest of his natural life to the fullest possible! 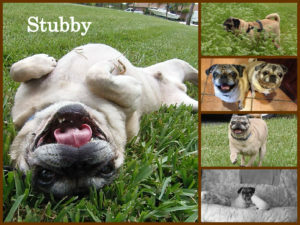 Stubby sends a huge Thank You to you all for your support over the years!